Widely considered to be an important chronicler of New Zealand’s social history, Laurence Aberhart has also been deeply interested other cultural contexts such as USA, France, Macau and Japan. In 2010 the photographer travelled to the USA after a 22 year absence, documenting what used to be the heartland of the American industrial empire. 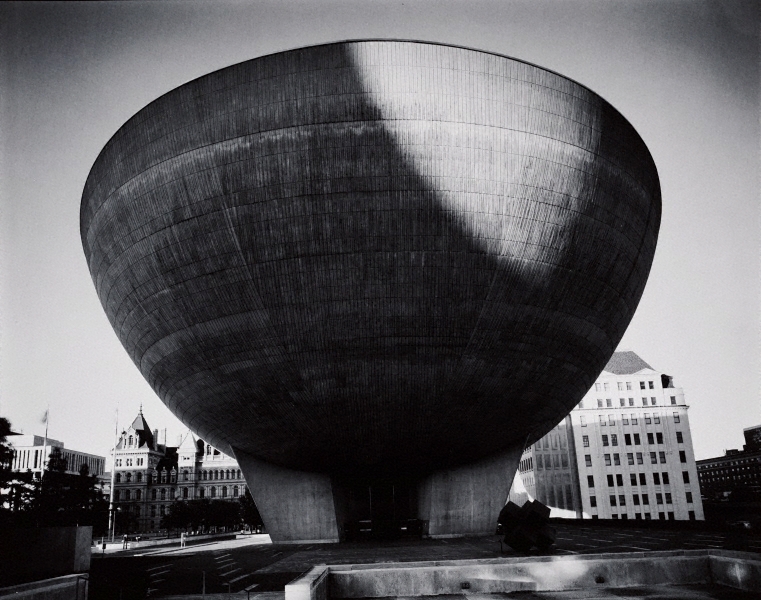 ‘The Egg, Albany, New York, 7 September 2010’ depicts a famous performing arts venue that is also a late modernist architectural landmark. Its monolithic structure, constructed between 1966 and 1978, is a stroke of engineering brilliance and an example of the ‘brutalist’ aesthetic that reflects the triumph of post-war America. Aberhart stresses the striking contrast between the classicist buildings and The Egg, which co-exist in an eerily de-populated atmosphere. The last rays of sunshine (as well as the exact date of the photograph) indicate the irrevocable work of time and probability of decay. Signed and dated l.r., white ink and l.r verso, pencil "L. Aberhart 2010/...". L. Aberhart, Artnews New Zealand , ‘Goodbye, American dream’, Spring 2011, 96.